18.5 in. 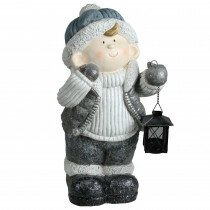 Snowy Woodlands Little Boy Holding Tea Light Lantern Christmas Tabletop Figure From the Snowy Woodlands Collection. This little boy will light the way to your next holiday adventure. Features a little boy holding a tea light candle lantern. Wearing a white turtleneck and blue vest matching hat and mittens blue jeans and boots. Lanterns uses tea light candles only. Candle not included. Dimensions: 18.5 in. H x 11.75 in. W x 7.75 in. D. Material(s): magnesium oxide.